West Benton Fire Rescue is focused on providing educational opportunities to the community as part of our mission. By providing quality safety education and topics of interests to our residents and businesses, it is our hope that we will continue to make a positive impact on the health and safety of our neighborhoods. Our goal of prevention and safety is to prevent the loss of life and damage to property and environment through the establishment of community partnerships, information dissemination, code development, planning, education and enforcement, and active involvement in our community. How do I find out if today is a Burn Day? Under the residential burning program, only residents located outside of the Urban Growth Area are allowed to burn. Residents outside the UGA must still call the residential burn line to find out whether or not it is a burn day. The phone number is 800-856-6377, and is updated on a daily basis. See the Burn Decision and UGA Map. To search whether your address is within an Urban Growth Area of Benton County, click here and scroll to the bottom of the page. Failure to adhere to these rules may result in the issuance of a violation and/or fine. 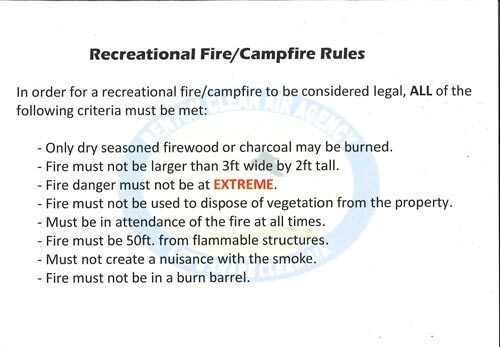 Failure to adhere to the guidelines listed above may result in a violation and/or fine. 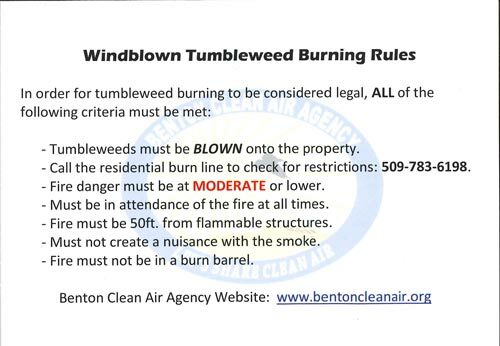 Secondly, if it is a burn day, you need to call the fire department Administrator at (509) 786-3873 to give us the address of where you will be burning, as well as your name and a contact number. This information is helpful if a neighbor or someone calls in to report the fire. If the report is in the general area of the address we have on record, we know that the property owner has already done their due diligence and we may not need to send all fire trucks immediately to the property. Emergency 9-1-1: Call When It Counts! 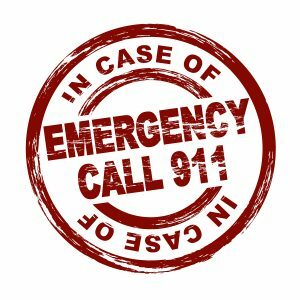 Call 911 if there is a threat to loss of life or property! Almost 2,500 people die in home fires every year in the United States. Most of these people live in homes that do not have working smoke alarms. Smoke alarms save lives. Keep your family safe. Put working smoke alarms in your home. Smoke is poison. It can kill you. Smoke alarms wake you up if you are sleeping. Put a smoke alarm on every level of your home and outside each sleeping area. Put a smoke alarm inside every bedroom. Smoke goes up. Put smoke alarms on the ceiling or high on the wall. Test your smoke alarms. Push the test button. You will hear a loud noise. If you don’t hear the noise, you need a new battery or a new alarm. Fix this immediately. Smoke alarms with long-life batteries will work for up to 10 years. You do not change the battery. Complete the Smoke Detector Program Request on the Forms page to request a free smoke alarm, which the firefighters will then install for you, for free. Ionization smoke alarms are generally more responsive to flaming fires. How they work: Ionization-type smoke alarms have a small amount of radioactive material between two electrically charged plates, which ionizes the air and causes current to flow between the plates. When smoke enters the chamber, it disrupts the flow of ions, thus reducing the flow of current and activating the alarm. 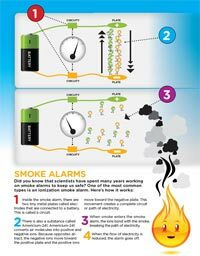 Download this infographic on Ionization Smoke Alarms. Photoelectric smoke alarms are generally more responsive to fires that begin with a long period of smoldering (called “smoldering fires”). How they work: Photoelectric-type alarms aim a light source into a sensing chamber at an angle away from the sensor. Smoke enters the chamber, reflecting light onto the light sensor; triggering the alarm. 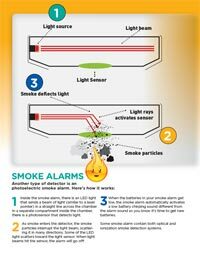 Download this infographic on Photoelectric Smoke Alarms. It is recommended both (ionization and photoelectric) technologies be used in homes. In addition to individual ionization and photoelectric alarms, combination alarms that include both technologies in a single device are available. When Should I change my Battery? West Benton Fire Rescue recommends changing standard 9V battery twice a year and sealed housing lithium battery alarms every 10 years. A smoke alarm is a simple little gadget that nearly always makes the difference between life and death in the event of a house fire. Don’t let the simple things in life get away from you, check your battery TODAY! Do You Provide Smoke Detectors? YES! through a generous community grant provided by Prosser own Cooks Ace Hardware, we have smoke detectors available, to be installed by our firefighters in your home. Visit the Services page to find out how you can get a smoke alarm installed. A fire can be a catastrophic event, leading to destruction of property of loss of life. To ensure that your staff and employees are protected in the event that a fire breaks out, it is essential that every business have a fire safety plan in place. This fire safety plan should include a detailed evacuation plan that all employees are made aware of so they can exit the building quickly in the event of a fire. Use a fire extinguisher when all of these questions are answered “yes.” If you’re unsure about whether or not its safe to use a fire extinguisher, and for all other situations, alert others, leave the building, and call 911 from a mobile or neighbor’s phone. Is the fire small and contained in a single object (like a pan or wastebasket)? Fire Extinguishers check within the last 12 months. Fire Extinguishers should be within 75 feet of an exit and mounted along the path to the emergency exits. All required EXIT signs are in place and illuminated. Building address and/or Unit Number is visible from the street. Extension cords must be used properly. Have only one (1) cord per appliance. Have cords of the proper size. Amperage ratings greater than the appliance they are serving. All Extension cords are in good repair and not damaged. Do not plug extension cords into extension cords. Exit doors, hallways, aisles and other pathways of egress must be kept clear of obstructions. Combustibles must be stored properly by not storing them in heating and mechanical room. West Benton Fire Rescue will conduct a course on the proper use of fire extinguishers for area businesses or at a community event. During the half-hour training firefighters will demonstrate the P.A.S.S. technique as well as go over some visual checks that should be conducted, in addition to any maintenance outside vendors may conduct. To schedule a class at your business contact us, or call (509) 786-3873. Often called the silent killer, carbon monoxide is an invisible, odorless, colorless gas created when fuels (such as gasoline, wood, coal, natural gas, propane, oil, and methane) burn incompletely. In the home, heating and cooking equipment that burn fuel are potential sources of carbon monoxide. Vehicles or generators running in an attached garage can also produce dangerous levels of carbon monoxide. In 2010, U.S. fire departments responded to an estimated 80,100 non-fire CO incidents in which carbon monoxide was found, or an average of nine such calls per hour. The number of incidents increased 96 percent from 40,900 incidents reported in 2003. This increase is most likely due to the increased use of CO detectors, which alert people to the presence of CO.
Often called the silent killer, carbon monoxide is an invisible, odorless, colorless gas created when fuels (such as gasoline, wood, coal, natural gas, propane, oil, and methane) burn incompletely. In the home, heating and cooking equipment that burn fuel can be sources of carbon monoxide. At this time, West Benton Fire Rescue only provides smoke alarms for residents, not carbon monoxide alarms. For more information on that program, please visit our Services page. Advanced Life Support with CPR in progress. We use this categorization as the basis of our tiered response system. A rainy spring provides the most optimum environment for our wildland fuels to grow and doesn’t benefit the fuels overall moisture content much at all. 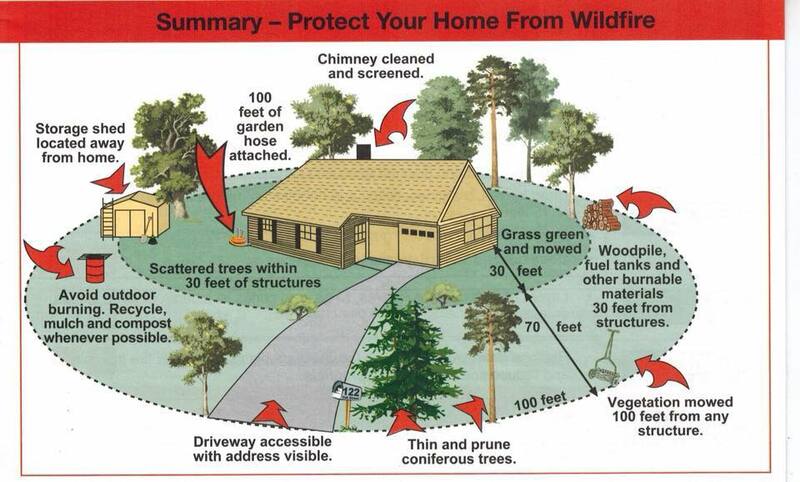 Below you’ll find a summary on how to protect your property from wildland wildfire. You’ll also find pictures of our recent survey on how the fuels in our specific area are doing. In years when our winter temperatures are mild, dry standing fuels can stand tall and provide lots of fuel for wildland fires. 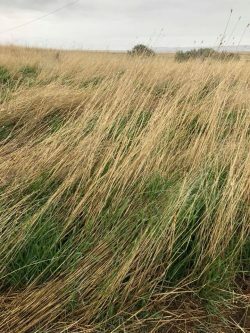 Combined with well hydrated low level grass continuing to grow from spring rain; it’s a recipe for hot and fast burning fuels with long flame lengths once all dried out later in the summer. Help us, help you; prepare your property for the best outcome possible in the event of a wildfire. In the event of a fire, call 911 at first notice. When we are alerted of fires promptly by you, our citizens, this helps us get the fires out quicker; but also helped us contain them sooner and to smaller fires; Thank you! Most fires begin in the home. Whether the home is a single-family house or an apartment building, there are basic precautions you can take to prevent fires, including cooking fire safety. Everyone in the home should have a plan and be prepared to respond quickly if they discover a fire. Every family member should be included in the plan. Young and old may need help to escape. Mark two ways out of every room and Include windows. Pick an outside meeting place for everyone to gather. Practice your plan, especially with children. Make sure everyone can hear and recognize the sound of the smoke alarm. Fire spreads quickly. Get out fast and stay out. If possible, close doors to confine the fire. If you encounter smoke, crawl under it to your exit. Go to the meeting place and call 911 as quickly as possible. Once out, stay out. Do not go back for anything. If smoke or fire blocks your first exit, try your second escape route. If you can’t escape, you will need to seek refuge inside a room with a window. Close all doors between you and the fire. Use towels or bedding to seal the door cracks to keep smoke from coming in. If possible, call 911 to report your exact location. Whether you live in a high-rise condominium or a 2-story apartment building, there are steps you can take to remain safe from a fire. If you hear the building fire alarm, take it seriously. Every second delayed wastes valuable time needed to escape. For this reason, developing and practicing a home escape plan with all residents is so important. If a fire starts in your building you must know how to get out quickly. Don’t wait to find out the severity of the situation. Your home escape plan should include two ways to exit out of your apartment and a designated outside meeting place away from the building. Remember to not use the elevator during a fire emergency. If you are unable to use the stairs, stay in your apartment and call 9-1-1. Tell the dispatcher where you are and ask for help. If the fire is in your unit, quickly go to the stairwell, pull the fire alarm, and wait on the stair landing for help. Unattended cooking is the leading cause of house fires in the Prosser area. Never leave the kitchen when frying, broiling or grilling food. If you must leave the stove, turn it off or set a timer to remind you to check the food. It is always best to prevent a fire than to have to deal with one. Remember to use a moderate cooking temperature, don’t overfill the container, and if you must leave the kitchen, turn the burner off . Unattended cooking is the primary cause of kitchen fires. Over half of these are grease fires. Turn pot handles away from the front of the stove. Curious children may reach up and grab the handle, pulling the hot contents down on themselves. Don’t position handles over another burner, it may catch on fire or burn someone who touches it. Wear short sleeves or tight fitting long sleeves when cooking to reduce a clothing fire hazard. Shield yourself from scalding steam when lifting lids from hot pans. Make sure pot holders are not too close to the stove. They could catch fire! Keep ovens, broilers, stove tops, and exhaust ducts free from grease. If there is a fire in the oven – Turn off the oven and keep the oven door closed. Always, have a working smoke detector! Over half the people attempting to extinguish a kitchen fire are injured. Often the best advice is to get everyone out of the house and call the fire department (911) from a neighbor’s house. Never try to move the pan, don’t throw water on it, and don’t put flour on it. If you attempt to extinguish the fire, it is best to use a class ABC multipurpose fire extinguisher. Follow the manufacturer’s instructions – stay back 6 to 8 feet and be careful not to spray the grease out of the pan. Baking soda can also smother the fire. If the fire has not burned for more than fifteen seconds, it may still be possible to turn the burner off and use a tight fitting lid to smother the fire, but only if the fire is still small and has not spread beyond the pan. Heat Cramps: symptoms include muscular pains, cramps and spasms due to the strenuous activity, usually involving muscles in the arms, legs or abdomen. To care for heat cramps, stop activity and rest in a cool place. If fully alert, take sips of cool water. Avoid alcohol or caffeinated liquids. Remove or loosen tight clothing and apply cool, wet cloths. Do not return to activity for a few hours after cramps have subsided. Seek medical attention if the cramps do not subside within an hour. Heat Exhaustion: symptoms include skin that is cool, moist, clammy, pale, flushed or red and sweating heavily; headache; nausea or vomiting; weakness, dizziness or fainting; body temperature will be near normal. To care for heat exhaustion, go to a cool, shady place. Lie down and loosen clothing. Apply cool, wet cloths. If no signs of nausea, sip cool water. Avoid liquids with alcohol or caffeine. If vomiting continues, call 9-1-1. Heat Stroke: symptoms include hot, red and dry skin; no sweating; changes in or loss of consciousness; rapid pulse; rapid, shallow breathing; body temperature can be very high. Heat stroke is life-threatening! Call 9-1-1. In addition, go to a cool, shady place. Quickly cool the body by wrapping wet sheets around the body and fan it. If using ice packs, wrap them in a cloth and place them on each wrist, ankle, armpit, and on the neck to cool the large blood vessels. Watch for signs of breathing problems and make sure the airway is clear. Keep the person lying down. Stay in the shade. Wear a hat or use an umbrella. Wear lightweight, loose-fitting, light-colored clothing. Avoid strenuous activity. If you must, do so during the coolest part of the day, usually in the early morning hours and take regular breaks in a cool place. Drink plenty of water to avoid becoming dehydrated. Avoid alcohol which can dehydrate the body and reduce awareness of potential signs of heat stress. Also, avoid caffeinated beverages such as coffee, tea, and sodas which can also dehydrate the body. If you do not have air conditioning, spend as much times as possible at public locations that are air conditioned such as senior centers, libraries, movie theaters, indoor malls, etc. Avoid using the oven or clothes dryer during the hottest part of the day. Never leave infants, children or animals unattended inside a vehicle.